These signals are Soviet built and were installed in some places by the DR. They show the same aspects as Hl signals. See also OSShD signals. Click to get full picture. 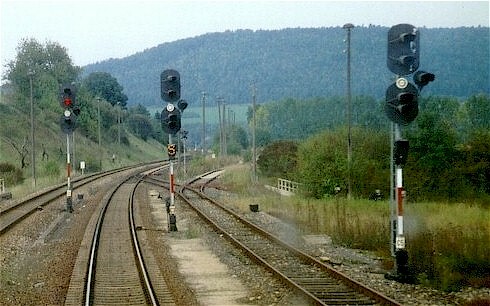 EZMG signals on the line to Meiningen, Thuringia. This signal shows aspect Hl 12a: clear with 40 km/h, expect stop. 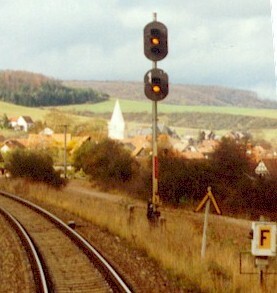 To the right of the signal, the yellow chevron is an So 7a: raise snow plough signal, the box with the "F" is a signal telephone.